If you’ll be visiting Brazil, it’s good to know about some options that are literally off the beaten path. 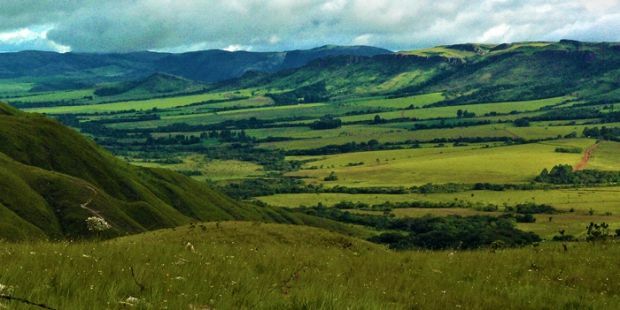 The Serra da Canastra is one of Brazil’s most important national parks, located in the southern part of Minas Gerais state, about 200 miles from its capital, Belo Horizonte. The park gets its name from its shape, said to look like a chest or trunk (although today “canastra” has come to mean wicker basket in Brazilian Portuguese). “Serra”, on the other hand, means mountain range, or saw. On top of the Canastra plateau lies the source of the longest Brazilian river entirely inside Brazil, the São Francisco. What starts in the park eventually empties out into the Atlantic ocean, almost 2,000 miles away, in the Northeast. Less than 10 miles from the river’s source, the water picks up strength in the form of the park’s famous 600-foot waterfall (one of several), called Casca d’Anta. If you go for more than a quick look around and a photo-op under the waterfall, it’s helpful to also know the Serra da Canastra’s tropical grassland savanna, forests and two plateaus stretch out for over 71,000 hectares and require almost one week of traversing for a serious visit. After all, there will need to be time set aside to try and catch a glimpse of some of the local “residents”. Those include: Maned wolves (the largest canines in South America; a cross between a fox and a wolf), giant anteaters, Canastra armadillos, and the Brazilian merganser (one of the most threatened bird species in the world), among many other types of animals. Below, you can see a news report (in Portuguese) where the reporter teams up with biologists and park rangers to locate some of the flora and fauna. Before you take off to Brazil, consider learning some basic Portuguese. It will make your life much easier during the trip. I will also allow you to get more out of Brazil and create great relationships there. You can start by downloading our free Travel Portuguese lesson. Then, to make sure you speak Portuguese correctly and comfortably in Brazil, go ahead and choose a Portuguese for Travel package. Enjoy the convenience of having your own private Street Smart Brazil tutor via Skype. It is a simple and effective way to learn Portuguese and get the best out of your trip.